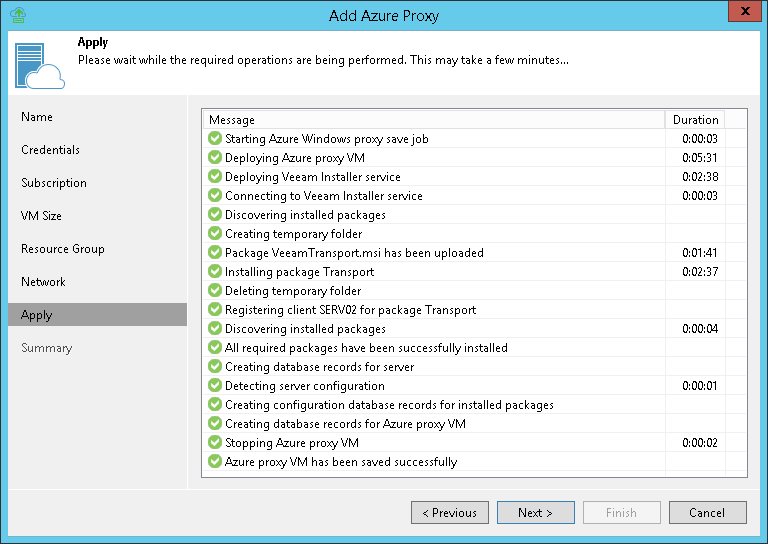 At the Apply step of the wizard, Veeam Backup & Replication deploys the Azure proxy with specified settings. You can view the deployment progress in the real-time mode. When the configuration process is over, click Next. At the Summary step of the wizard, click Finish to close the wizard. The Azure proxy deployment may take several minutes. You can close the Azure Proxy wizard and continue working with Veeam Backup & Replication while the proxy is being deployed. To view the deployment progress, open the History view, in the inventory pane select System, and double-click the task of the proxy deployment in the working area.